Best Outdoor Camping Chairs | Rated and Reviewed for You. Find the best outdoor camping chairs here. best camping chairs. ranked. reviewed. tested. Searching for the best outdoor camping chairs? Indeed, after a long day on the trail, you want to relax and get comfortable. Really, who wants to cozy up on a rock after logging 20 miles on the trail? That’s why you need a great camping chair. The best camping chairs provide portable comfort, without taking up valuable real estate in your pack. Best Foldable Camping Chairs – These are traditional seats with fold-down legs and a pocket-like back. Foldable camp chairs provide incredible comfort, and they fold down to about the size of a Nalgene bottle. The trade-off: Foldable chairs tend to be weightier compared to stools and ground seats. Best Camping Chairs and Stools – Lightweight and portable, camping stools are a convenient option for sitting down, whether you’re back at camp, or stopping for a trailside lunch. Plus, most fold down to the size of a rolled-up newspaper and weigh a pound or less. Best Camping and Hiking Ground Chairs – Ultra-lightweight and compact, ground seats provide a cushion and backrest, and they have a minimalist footprint. These seats don’t take up pack space, but might not offer the reclining comfort of a foldable chair. Ready to check out our favorite and most popular camping chairs of the year? Whether you’re headed out on a day hike, or you just need a seat for camping (and occasional tailgating), any of these camping chair will make a great addition to your gear stash. Searching for the best foldable camping chairs? Foldable chairs are super versatile. If you have the pack space, they’re perfect for backcountry jaunts, but you can get great miles out of them. 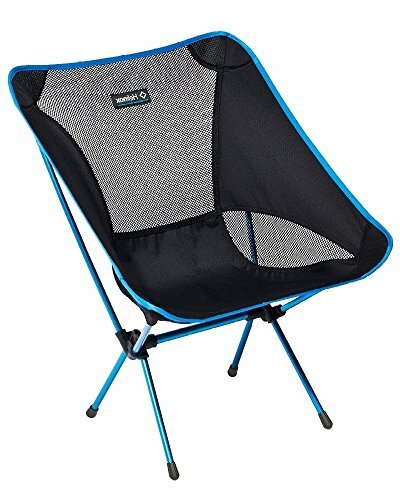 Most foldable chairs also are perfect for car camping trips or even tailgates. 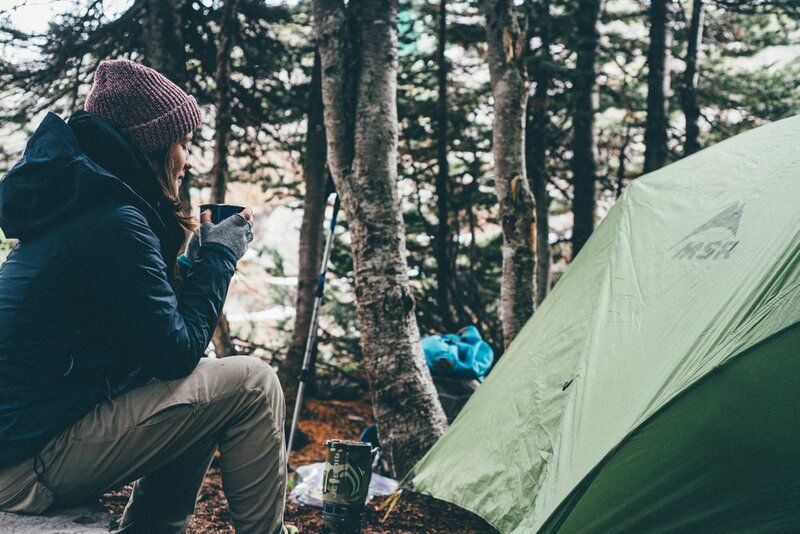 Bottom line, a great foldable camping chair will provide comfort, no matter the adventure. The Helinox line from Big Agnes is a favorite of outdoor enthusiasts. And the award-winning Chair One is a perfect example. Chair One is a rugged, durable and lightweight foldable chair. It’s comfortable. The seat is deep and supportive, and the mesh pockets give breathability. That’s a huge plus after a hot day on the trail. For a backpacking chair, Chair One offers a lot of great features. The seat is designed for fast stow-and-go assembly and disassembly. That’s thanks to the self-locating pole design. Just shake it, and the poles lock into place. Then just attach the seat, and you’re ready to go. Plus, Chair One is lightweight, coming in at just over two pounds, and for a low-profile chair, it’s super stable. Another great feature: Helinox offers tons of color schemes and graphic prints. Folded Size: 13.8 in. x 4.7 in. Pros: Chair One’s self-locating pole system is a real winner. It makes assembly a breeze. Plus, the chair earns high marks for durability. This chair will last you many miles. Cons: Chair One does have a low profile, and that makes getting in and out a challenge (especially when your legs feel like mush). Plus, it’s fairly small. Go for the XL model, if you’re worried about space. Final Verdict: Chair One is an award-winner with a sleek look. But it’s more than just a cool chair; it’s also super-comfortable and one of the lightest in the class. >> Learn how you can buy the Helinox Chair One for Outdoor Camping! The Yizi has the look of a chair you might take car camping. Yet, it has some serious backpacking credibility. For starters, it has one of the smallest footprints in the category. The chair fits into a 11-by-4-inch case and stows nicely. You’ll also get great comfort from the YIZI. The chair has one of the deepest seats for a foldable hiking chair, and thanks to its adjustable height, you can tune it for fit. Plus, the Yizi is one of the most affordable options on the market. As such, you won’t get interesting graphic prints. The Yizi is available in five block colors. Folded Size: 11 in. x 4.3 in. Pros: There are three height settings – 13, 14 and 15 inches – which is great for taller people. Plus, the chair’s price-to-quality can’t be beat. The Yizi is affordable and super sturdy. Cons: Assembly is fairly complicated, until you get the hang of it. You might want to set it up a few times before you head out. Plus, stability isn’t great in sand or with a gradual slope. You’ll want to find a flat location for this chair. Final Verdict: The Yizi’s tiny footprint makes it a great choice if real estate in your pack is at a premium. This is an excellent outdoor camping option for your next camping trip. >> Learn how to buy the Trekology Yizi Go Portable Camping Chair. 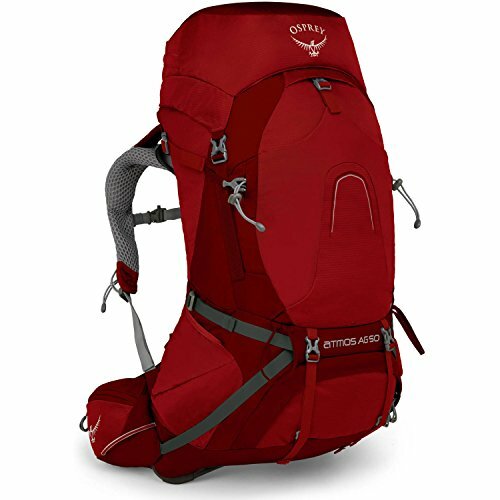 Looking for the most lightweight option for backpacking trip? The Monarch is the chair you’re looking for. 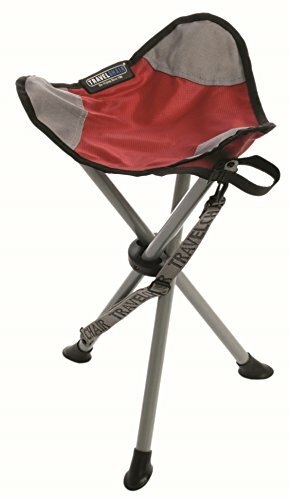 This is a favorite backpacking chair that’s won numerous awards, and it has a super unique design. The Monarch is a two-legged chair. It’s a balancer. Your feet act as the other two legs. That designs makes this chair a perfect choice for just about any ground conditions. The Monarch also weighs just 1.3 pounds. And it stows down into a 12-by-4.5-inch pouch. That makes it an ideal choice for backpackers. A lot of long-distance trekkers love this seat for its simplicity. 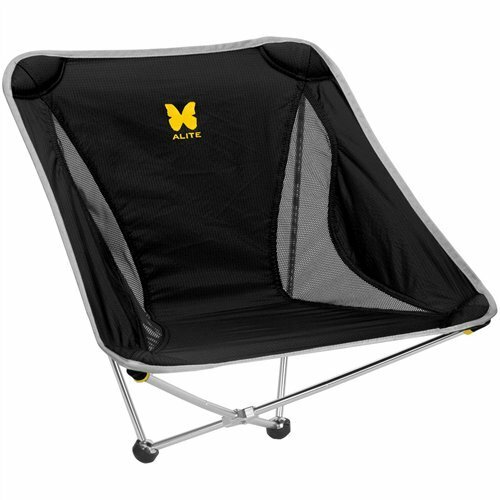 Plus, the Monarch camping chair is elegantly design. It’s low-slung, sitting close to the ground, almost like a minimalist Adirondack chair. And it’s available in a number of cool color schemes, like woodgrain blue. Carrying Size: 12 in. x 4.5 in. Pros: For a bucket seat, it doesn’t get much lighter than the Monarch. The balancing takes some getting used to, but once you’ve got it down, the comfort is really incredible. Cons: The two-leg design isn’t ideal for every application. You wouldn’t take this chair tailgating, for instance. But after a day of hiking, it’s practical. Because of its low-profile, the Monarch can be a bit of a struggle to get in and out of. Final Verdict: The Monarch is one of the best backpacking chairs. It’s light AND super comfortable. >> Learn how to buy your Monarch Outdoor Chair. Searching for the best camping stools and chairs? Well, we have them here for you. Camp stools are so great, because they’re portable and comfortable. A great foldable camp stool goes anywhere, and it doesn’t require set-up. Whether you need a footrest during a hiking stop, or you need something light for base camp lounging, a stool is the way to go. Walkstool manufactures two lines of camping stools: the Basic and the Comfort. The Comfort stools offer an upgrade over the Basic models. They’re built with sturdier aluminum poles and they’re a bit lighter. Those are two reasons this is a favorite camping stool. It’s rugged and sturdy, and it’s built for long-term use. In terms of design, the Comfort camping stool is straightforward. It’s a telescoping three-leg design. You just open the legs, extend the legs, and the seat is ready to go. Plus, it’s available if four different heights – 18, 22, 26 and 30 inches – which is perfect for taller hikers. 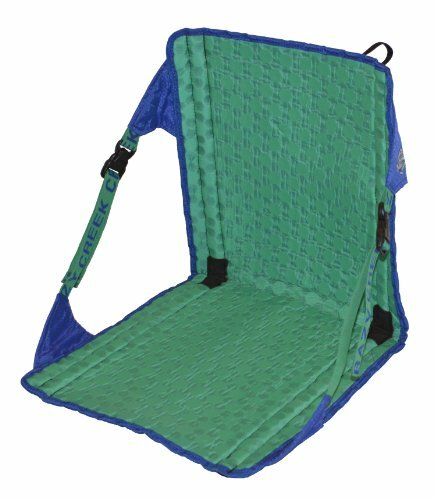 The nylon-mesh seat also has a shallow bucket design, which is designed for ergonomic comfort. Carrying Size: 15 in. x 4. in. Pros: The Comfort stool has one of the highest capacity rating on the market. It can hold 400+ pounds reliably. In other words, it can hold you and your 50-pound pack, no problem. The legs telescope too, which minimizes it’s carrying size. Cons: You’ll either love or hate the shallow bucket seat, or “crotch” seat. When seated, you have to straddle one of the corners of the seat, and for some that’s not the most comfortable seating position. Also, putting the stool back in the stow sack can be a bit of a hassle. Final Verdict: The Comfort camping stool is built rugged and designed for the heaviest of loads. This is a camping stool that you’ll never have to replace. Definitely worth checking out if you are searching for camping stools that offer comfort and support, with a lightweight frame! >> Learn how to buy the Walkstool Comfort Camping Stool. The GCI Outdoor Freestyle Rocker is a portable folding chair with some of the best comfort on the market. 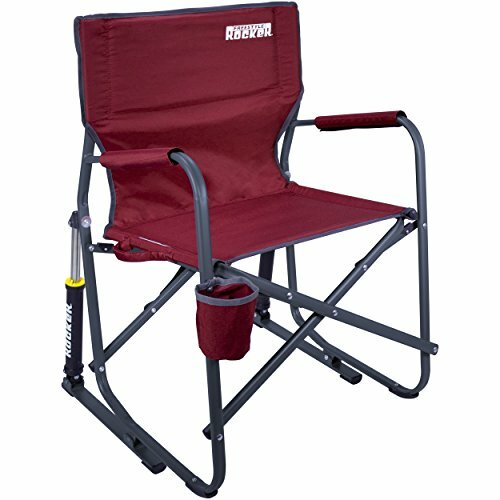 The outdoor folding chair for camping is fairly simplistic in design. It’s a four-legged chair with a heavy-duty nylon seat. But upon closer inspection, this one is built for outdoor adventures. For one, the seat is flat. That makes it useful as not just a seat, but also as a small basecamp table, if needed. Plus, the PackSeat outdoor is light, weighing just 1.5 pounds, and it packs down to 15-by-4 inches. That makes it versatile for long-distance adventures. You can clip this to the exterior of your pack and use a compression strap to hold it in place. That gives you quick access to a seat at all times. Pros: The PackSeat is lightweight and portable. It’s small enough (about the size of a smaller umbrella) that you can clip it to your belt and be on your way. Cons: The PackSeat is super affordable. That’s great. But this might not be the most rugged option on the market. This might be a piece of gear you have to replace after heavy use. Plus, the PackSeat is rated for 250 pounds, but that might be pushing it to its limits. Final Verdict: For portable seating on the trail, the PackSeat is perfect. A great addition companion for day hikes. >> Learn how to get your GCI Outdoor Freestyle Rocker Chair! Like the Comfort stool, the Slacker Chair is a three-legged “crotch” stool. You straddle one of the corners of the seat, when sitting. But still, it’s one of the most comfortable on the market. The Slacker Chair is fairly lightweight, weighing 2.2 pounds. That’s due in part to its steel legs (the lighter ones use aluminum). And that makes it more comparable to a foldable chair. Some other great features about this chair: The Slacker Chair for outdoors comes equipped with a carrying sling. Just throw it over your shoulder and take it anywhere. In terms of its footprint, the Slacker Chair folds down to the size of about a small umbrella or travel tripod. That makes it easy to attach to the exterior of your hiking pack. Carrying Size: 24in. x 3in. Pros: The Slacker Chair is reasonably comfortable, especially if you just want to get off your feet while hiking. Cons: It’s affordable, but the build quality isn’t as high as other stools. The legs can sink in unstable dirt or sand too, making it a bit wobbly. You might also want a flat seat, if you don’t like the three-corner “crotch” design. Final Verdict: You can’t beat the Slacker Chair’s price, and for a three-legger it’s fairly comfortable for outdoor camping. >> Learn how you can buy the “TravelChair” Slacker Chair! 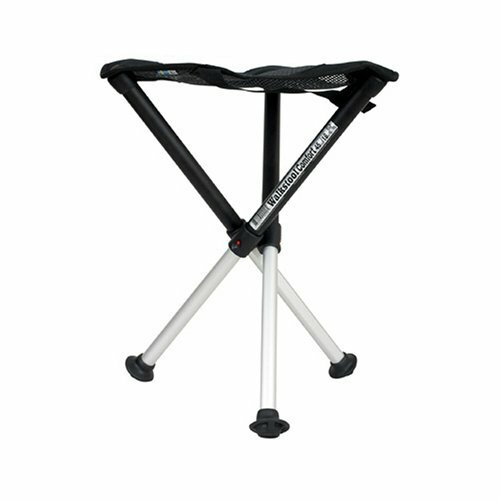 The Ultralight Stool is a folding stool, unlike the other three-legged stools reviewed here. That provides a few benefits. For one, the seating area is larger and flat. The large Ultralight Stool has an 11-by-9-inch seating area, and it sits relatively low to the ground at 14 inches. Most of the three-legged stools sit a bit higher. What’s also great: the stool is ultralight. The shorter, smaller version is just 11 ounces, less than a pound, while the larger version weighs about 1.3 pounds. That makes it a great option for backpacking trips. The seat for this outdoor folding stool is also very comfortable, especially compared to the designs that require you to straddle a corner. And although it’s affordable, Trekology has used high-quality materials in the build, including Oxford nylon and aluminum alloy poles. Carrying Size: 16 in. x 8 in. Pros: The folding design makes this more stable than three-legged stools. And it also saves space in your pack. The Ultralight Stool stows flat to just about an inch thick. Cons: The size leaves something to be desired. The “large” sits 14 inches off the ground, which is perfect if you’re backpacking. For any other adventure, like watching a parade, it’s much too short. If you’re not backpacking, it does make a great footrest, though. Final Verdict: A stable and tiny backpacking stool, the Ultralight is great seat when pack space is a concern. Overall, if you are searching for a camping stool that can stand up to tough weather conditions, while remaining comfortable, this could be it. 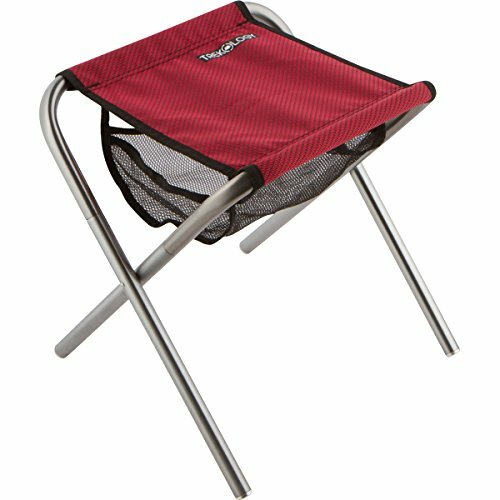 >> Learn how to buy your Trekology Portable Folding Camping Stools! Ground seats are perfect for backpacking. They take seconds to “assemble,” they’re super lightweight, and they fold down to fit just about anywhere. But they’re not just great for camping. A great ground seat adds support in the bleachers, or some cushion around the campfire. Crazy Creek was one of the first to introduce folding ground chairs, and they’ve pushed the boundaries of design and innovation. The Hex 2.0 is, hands down, one of the best from the company. It’s lightweight and stowable, making it the perfect chair for backcountry trips. But it’s also super comfortable. The Hex 2.0 camping chair is built with an updated EVA foam pad with a unique hex design. This adds plenty of padding, without adding bulk. Plus, the seat features sturdy carbon-fiber stays, which provide great support for the backrest. Overall, it’s one of our favorite trail chairs. Carrying Size: 16 in. x 4.4 in. Pros: When rolled up, the Hex 2.0 fits just about anywhere. Put it in the side mesh pockets of your pack for easy access. The Hex 2.0 also provides great back support, which is a plus compared to stools. Cons: The seating area is somewhat narrow; it’s just 16 inches wide. That makes it a tight fit for some. Plus, the Hex’s cushion, although a space saver in your pack, can sometimes feel a little lacking on hard surfaces. Final Verdict: The Hex 2.0 might be simple in terms of design. But it’s big on comfort and convenient to stow. This is our favorite ground chair for camping, by far! >> Learn how to buy the Crazy Creek Products Hex 2.0 Chair for Your Outdoor Adventure! The Weekender is a pared-down version of the Hex 2.0. It doesn’t fold down as nicely, it’s a touch heavier, and the materials aren’t as high quality. But The Weekender is certainly more affordable, while delivering decent comfort. Here’s what we like: this camping chair has easy webbing straps so you can tune the fit. It’s also designed with webbing handles for easy carry (which is nice for football games or picnics, when you aren’t carrying a pack). In terms of portability, The Weekender is nice, but it’s not designed for rolling, like the Hex. That makes it a bit more cumbersome for backpackers. It’s also great for boating, providing back support during long hours under paddle. Carrying Size: 17 in. x 33 in. Pros: You can’t beat the price. The Weekender is affordable, especially compared to competitors. And it’s easy to use. Just adjust and get hours of great back support. Cons: The Weekender doesn’t roll, which makes it more difficult to stow. You could get away with strapping it to the front of your pack, though. Also, the chair’s back could be a bit stiffer. 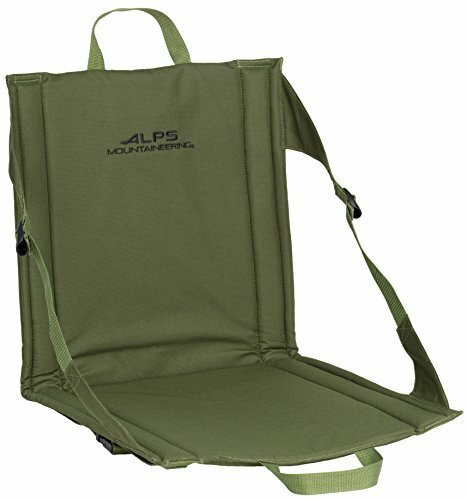 >> Learn how you can buy the ALPS Mountaineering Weekender Seat! The Air Chair is a relatively new product from Crazy Creek, but it’s got one supercool feature. The Air Chair takes all that’s great about the Hex 2.0, but also serves as a sleeping bag pad. The Air Chair for outdoor camping folds down into a 70-inch sleep pad. In other words, it’s a real space saver. Plus, the added padding helps to cushion your seat, which is a welcomed feature on the trail. Just inflate the pad, and enjoy 2.5 inches of padding. In terms of style, the Air Chair resembles the Hex 2.0. 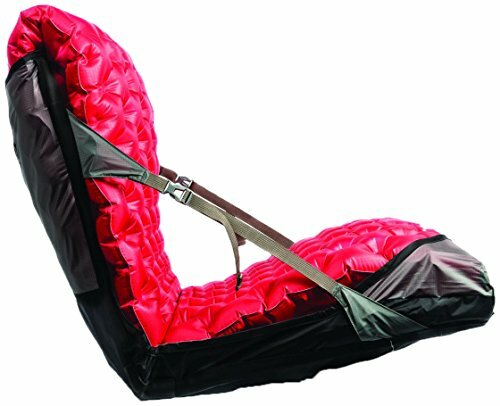 It features webbed straps on either side for adjusting seat angle, and it’s designed for easy roll-up stowing. The sleeping pad feature makes this a winner, though. Take your seat to the tent at the end of the night, and you’re all set. Carrying Size: 17 in. x 4 in. Pros: The Air Chair provides great support, and it’s cushier than the non-inflatable Crazy Creek chairs. Plus, the ability to serve as you sleeping pad makes this worth the investment. Cons: Inflating the seat adds another step to the equation when you get to camp. Plus, it’s not the lightest option, weighing more than 2 lbs. Final Verdict: The Air Chair is a camping chair and a sleeping bag pad. It’s versatile, and that makes it a great choice. Between this outdoor camping ground chair and the ALPS Mountaineering chair, we were impressed with the style and comfort! 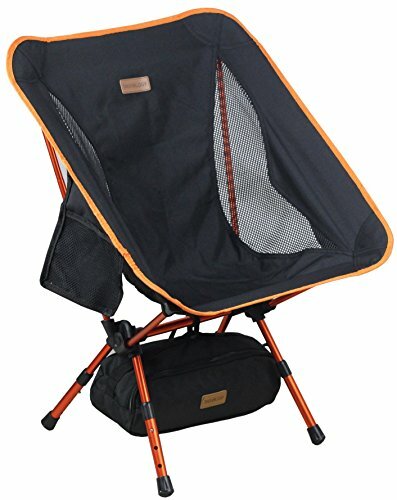 This is an excellent outdoor camping chair for most hiking and camping trips where you need a lightweight and sensible solution for sitting by a camp fire. >> Learn how to buy your Crazy Creek Air Chair for Outdoors! 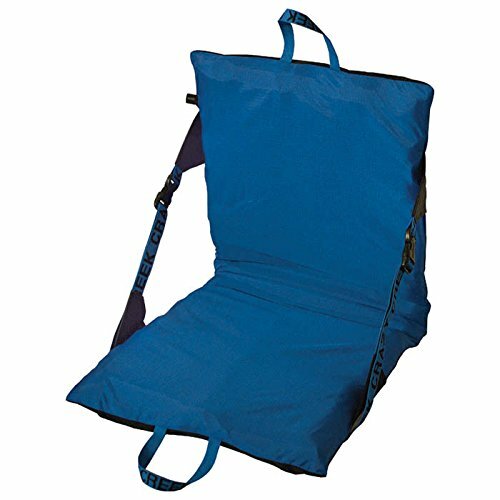 The Sea to Summit Air Chair is a “chair kit.” That means you can use the chair with your Sea to Summit inflatable sleeping pad. In other words, if you have to buy the pad separately (unless you already own on). That’s a bit of a pain, but it’s worth the investment. Here’s why: this ground outdoor camping chair is incredibly comfortable. Just inflate it, and you sink right in. That’s awesome after a day of hiking. Yet, you won’t notice it in your pack. The Sea to Summit Air Chair comes in at just 10.1 ounces, making a perfect addition to your ultra-lightweight rig. Plus, this chair is built with some great features, and it’s designed for heavy-duty use. The back panel and strap anchors are made from Ultra-Sil fabric, which helps prevent seams from coming loose, and the front elastic panel keeps the cushion in place. Other air chairs tend to push the cushion out, when folded. That’s not the case here. Overall, this is a super comfortable ground chair. Carrying Size: 18 in. x 5 in. Pros: The seat is nice and deep, and it provides plenty of back support. It’s also one of the most comfortable and lightest. Cons: This seat is designed for Sea to Summit sleeping mattresses. If you don’t own one, you’ll have to pick that up separately. Plus, the seat is fairly narrow. Final Verdict: The Sea to Summit Air Chair wins high marks for its comfort. It’s one of the best trail chairs for a cushiony seat. >> Learn how to buy the Sea to Summit Air Chair for Outdoor Camping! 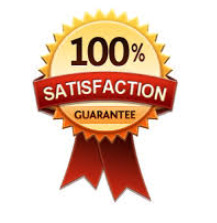 Simply find the review above and make a decision on which camping chair is best for you. But remember, at the end of a long hike, a camping chair can be the light at the end of the tunnel. The thought of lounging in a comfortable chair in front of the fire can help power you through. And every camping chair or stool listed above are worth the price. Sure, a chair might be a trail luxury. But the best camping chairs can transform your trip, and give you a place to relax and unwind at the end of a long day. Think we missed one of the best? 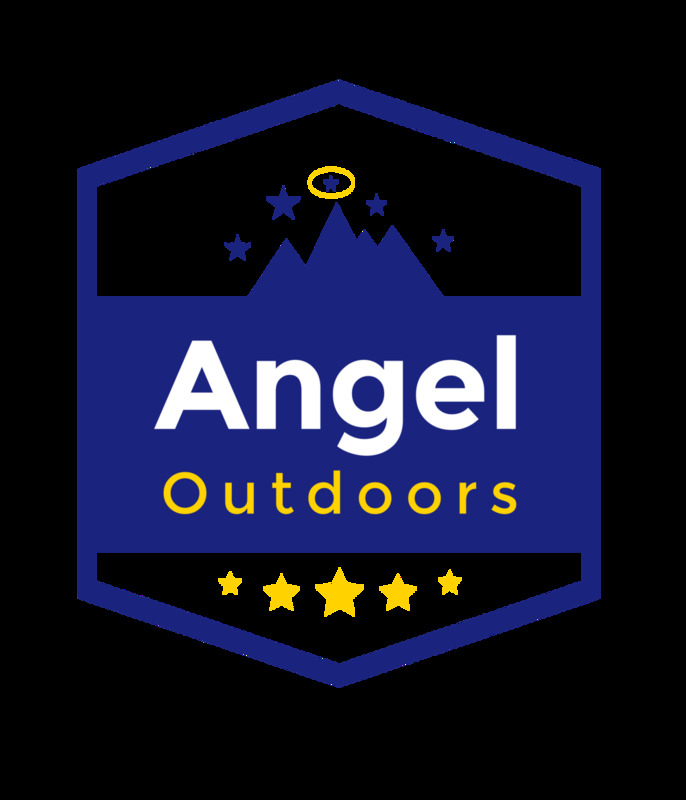 Connect with Angel Outdoors on social media and let us know. Enter to win our favorite Camping chair Now… Enter Your Email TO GET THE BEST CAMPING CHAIRS, STOOLS, and SITTING PRODUCTS ON THE MARKET. Subscribe to Get the Inside Scoop on Outdoor Gear!